In the long run, there is nothing about God–no activity or attribute–that cannot be a comfort to the Christian. That might strike some of us as too sunny a view on things. I mean, everything? Obviously, attributes like his compassion and his mercy are comforting, and his creation and salvation, but what about his jealousy, or his anger? Or how about this one? His derision. And David ascribes laughter to God on two accounts; first, to teach us that he does not stand in need of great armies to repress the rebellion of wicked men, as if this were an arduous and difficult matter, but, on the contrary, could do this as often as he pleases with the most perfect ease. In the second place, he would have us to understand that when God permits the reign of his Son to be troubled, he does not cease from interfering because he is employed elsewhere, or unable to afford assistance, or because he is neglectful of the honor of his Son; but he purposely delays the inflictions of his wrath to the proper time, namely, until he has exposed their infatuated rage to general derision. Let us, therefore, assure ourselves that if God does not immediately stretch forth his hand against the ungodly, it is now his time of laughter; and although, in the meantime, we ought to weep, yet let us assuage the bitterness of our grief, yea, and wipe away our tears, with this reflection, that God does not connive at the wickedness of his enemies, as if from indolence or feebleness, but because for the time he would confront their insolence with quiet contempt. The other consolation which follows is, that when the ungodly have mustered their forces, and when, depending on their vast numbers, their riches, and their means of defense, they not only pour forth their proud blasphemies, but furiously assault heaven itself, we may safely laugh them to scorn, relying on this one consideration, that he whom they are assailing is the God who is in heaven. When we see Christ well nigh overwhelmed with the number and strength of his enemies, let us remember that they are making war against God over whom they shall not prevail, and therefore their attempts, whatever they may be, and however increasing, will come to naught, and be utterly ineffectual. Let us learn, farther, that this doctrine runs through the whole gospel; for the prayer of the apostles which I have just quoted, manifestly testifies that it ought not to be restricted to the person of Christ. While we might look at the world, see wicked rulers, observe what seem to be tidal waves of unconquerable injustice, we can know that eventually all of these threats to the Kingdom of God will fall before the Lord and we will join in his mockery of evil. Even though we weep now, we can laugh with God now in anticipation of the day when the enemies of our God are finally and fully vanquished. Indeed, we have even better reason to do so than the Psalmist did. Back then, he was prophesying of a coming day when these things would happen; as the Church, you and I are living on the other side of Christ’s death and resurrection, in which he has, “disarmed the rulers and authorities and put them to open shame, by triumphing over them in him” (Col. 2:15 ), and made it possible that one day we will cry: “‘Death is swallowed up in victory.’ ‘O death, where is your victory? O death, where is your sting? '” (1 Cor. 15:54-55). 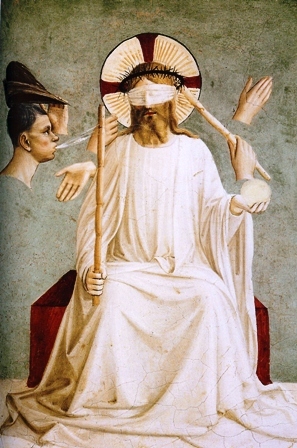 I can’t help but think that as Christ himself was being mocked, spit on, held in derision by the Nations–the Romans and his own countrymen–in the end, the Lord held them in derision knowing that it was in the midst of their injustice that he was laying the foundation for his own, ultimate victory. Take comfort, then, even in the derision of the Lord. If you are in Christ, he mocks your enemies–even sin, death, and the powers of Hell. They are nothing to him. What more shall we fear? ← Do We Need Jesus To Be A Lawyer Or A Doctor? Why Not Both?